"At your Own Risk"; challenging World Bank and IFC funded projects can cause you more troubles than expected. Despite severe ecological risks and the experts' voices like Dunu Roy. All in the name of development and green energy. The government of India has requested the World Bank's assistance to finance the proposed Vishnugad Pipalkoti Hydro Electric Project to be developed by the THDC India Ltd (THDC, a joint venture between the government of India and the government of Uttar Pradesh) on the Alaknanda River in Uttarakhand, the land where the Kedarnath tragedy unfolded in August 2013, when unprecedented floods claimed thousands of lives. The Vishnugad Pipalkoti Hydro Electric Project has been designed as a 444-megawatt, run-of-river hydropower scheme which, when completed, will generate an estimated 1,665 gigawatt-hours (or million kilowatt-hours) of electricity in a typical year. According to the proponents, this will represent a valuable addition of peaking power to India's Northern Grid, which faces severe power shortages at high-consumption times. The World Bank declares that "the objectives of the Vishnugad Pipalkoti Hydro Electric Project are: a) to increase the supply of electricity to India's national grid through the addition of renewable, low-carbon energy; and b) strengthen the institutional capacity of the borrower with respect to the preparation and implementation of economically, environmentally and socially sustainable hydropower projects." The contract for the construction of the civil works which includes the dam, the 12.1 km headrace tunnel, the underground powerhouse and the 3.07 km tailrace tunnel, was awarded to HCC Ltd. in January 2014 after the project received all its mandatory clearances. The contract for the electro-mechanical works has been awarded to BHEL India Ltd. Construction has begun but progress is somewhat slower than anticipated. According to the World Bank, a total of 265 families will be resettled under the project, and of these 92 percent are families from the village Haat, where the powerhouse is to be located. Being a run-of-river scheme, the bank authorities and the government ensure that limited impacts will be registered. This affirmation is being challenged by local communities in several occasions. Their main concern are the cracks and damages in the houses due to blasting of rocks for the construction of the tunnels; many villagers fear that these houses will collapse if there were to be an earthquake as the area is in a high risk seismic zone. Pollution of Alaknanda waters, along with the loss of aquatic species and also degradation of the natural habitat of endangered species such as the "Cheer" pheasant, otter, and Mahaseer fish is yet another major issue raised in the complaint. In addition to this, the complaint also says that due to the diversion of the river there is no river water available for religious and cultural rituals like bathing festival, funeral rites, river worship, etc. Thanks to the local concerned inhabitants, the World Bank was forced to send a delegation of experts to assess the situation on the ground in March 2013. These experts are members of the Inspection Panel the WB had to set up in 1993, following the Independent Review Committee which looked into the violations by Sardar Sarovar (Narmada) Dam resulting World Bank's withdrawal from the project. Pointing to the recent landslides in the Chamoli-Rudraprayag area of Uttarakhand, downstream of Vishnuprayag-Pipalkoti, the head of the Panel, ecologist Anubrotto Kumar Roy (better known as Dunu Roy) said in his letter that "much of the vulnerability of the region can be attributed to the extensive infrastructure development for the 29 HEPs (planned and under construction) upstream in the Alaknanda basin." After the publication of the final report, the same ecologist said his findings have been "radically altered to give a clean chit to the bank" . According to economist Bharat Jhunjhunwala, one of the first to object to the project, the World Bank's inspection panel was a farce. He said: "None of the issues we raised ­ from spiritual and cultural impact to impact on fisheries and the flawed cost-benefit analysis ­ were taken up by them. The final inspection report diluted most of the findings and is in fact a farce. ...Roy's outburst may have come too late as all funding has already been given for the project, but this can probably at least be an entry point for the bank to review their policy on funding projects of this nature." Villagers have always complained that whenever officials visit the site, nothing is done after that. Their concerns are not properly addressed nor clarified (see press release in the Comments box), probably because everybody knows the dangerous risks of continuing building hydroelectric schemes in this territory. Uttarakhand, as well as other Himalayan states, promote hydropower as a green source of energy and development for the mountain states. On the contrary, what they are opening the way to is the creation of sacrifice zones for the benefit of the hydro industry and of few large electricity consumers and industries. This conflicts is particularly worth to be mentioned for the efforts by the Indian government and company officials in widespread use of intimidation, including threats of physical violence and death, against outspoken members of communities that stand to be displaced or otherwise affected by World Bank-financed projects. 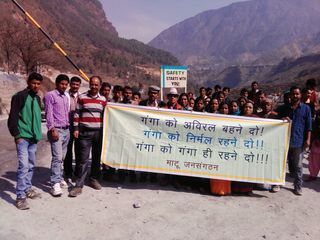 According to a scaring report from a major human rights group, Human Rights Watch (HRW), “At Your Own Risk: Reprisals against Critics of World Bank Group Projects,” the Vishnugad Pipalkoti Hydroelectric Project is one of those WB and IFC backed projects, where community protestors were allegedly threatened with violence and death by officials of Tehri Hydro Development Corporation India Ltd.
Project Details VPHEP is a 444 MW run-of-river scheme that includes the concrete gravity dam, an 8-mile-long headrace tunnel, an underground powerhouse that will contain four 111 MW vertical Francis turbine generating units and the 2-mile-long tailrace tunnel. The affected population are the displaced villagers, potentially their number is much bigger in case of accident. Development of Alternatives The slogans raised in the fights against dams in the regions are : “Ganga Chalegi Apni Chaal, Uncha Rahega Uska Bhaal (Ganga will continue to flow with its dignity intact)”, “Dekh Raha Hai Aaj Himalaya Ganga ke Rakhwaalon Ko (Himalaya is looking towards saviours of Ganga)”. Why? Explain briefly. The project is under construction despite the criticism of ecologist Dunu Roy and local inhabitants, and the national campaigns. The Villagers and Project Affected People of Vishnugaad – Peepalkoti hydroelectric project summons the officials of World Bank. World Bank is funding this project where people have continuously complained about the incomplete rehabilitation work in this project. The ecology and environment is getting largely affected due to the tunneling and overall development of this project. But World Bank has been cleverly showing that the problems have been resolved and this project should operation in a systematic manner. The second environmental clearance has been given to the project violating the Hon’ble Supreme Court’s order dated August 13, 2013. The affected people of various villages have surrounded the officials of World Bank again today. This happened whenever the officials visited the villagers. They remained silent mostly and diverted the question when asked about the questions regarding resolution of problems related to rehabilitation, ecological devastation and environmental concerns. On 2nd March also, the same thing happened with strong opposition from the villagers against the flawed developmental project and the promises from the Govt. and the World Bank. The dissent has spread all across the villages namely Palla, Jaakhola, Huon, Pokhni, Tirosi, Laanjhi, Harsari, Urgam, Matth, Jaretha, Bajni, Gangot, and Durgapur village. 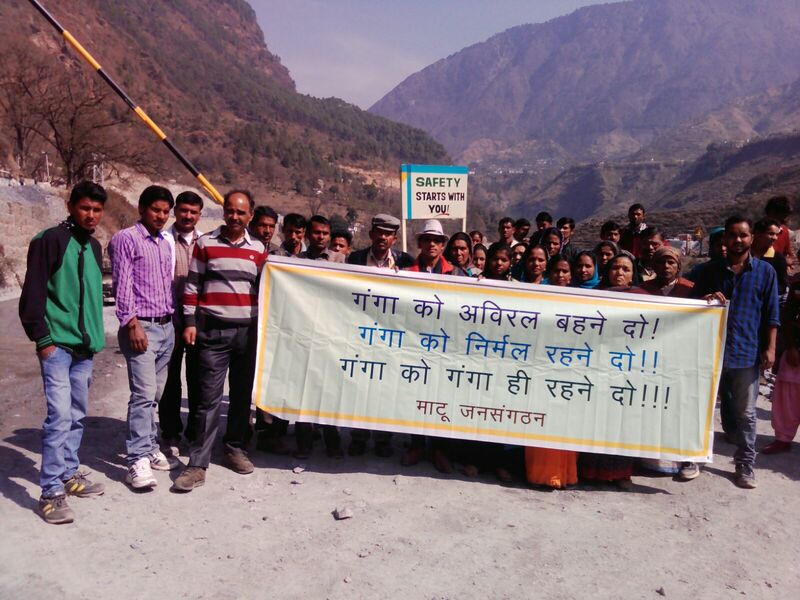 Villagers are going to be affected due to the tunneling work of this hydroelectric project. The tunneling has been questioned by various environmentalists on the ground of making hills vulnerable to landslides and ecological devastation. At the same time, from the cultural aspect, Murlidhar Bhandari of Pokhni village has put a question that if the Ganga River will go into the tunnel, where will they do the funeral? Sarpanch Maatbar Singh has asked about the replies which he have not received till now against the letter, he sent in October, 2015 to the Company associated with the development of this Dam. Sarpanch Kanvar Singh Bhandari of Laanji Village said that the tunneling will affect dangerously the water, forest, and the land of the affected area. Many others asked the similar questions but after listening to all the questions, the officials of World Bank has only replied that ‘we will come to your village next time’ and went back. The meeting was held in the ‘Siyasen’ Guest House of THDC, which is very much safe considering the distance from the actual place of tunneling. Contrastingly, after repeated claims of no destruction on the hills above the tunnel, THDC has not constructed any office there. It is clearly visible that putting the villagers in danger, they have marked themselves safe by keeping the office out of the affected area. The villagers of Durgapur village were not heard showing lack of time and other engagements. 21 villagers have been framed in a legal case by a contractor company of THDC, alleging the disruption to the project work. The village is going to face the landslide as it is situated at the outlet of the tunnel from where the river will come out. The people have stopped the project work, staged protests, movements which was stopped by the district magistrate of Chamoli with an assurance of an investigation and report on likely impacts on the village due to the blasts carried out for tunneling under this project. The investigation is not yet completed; compensation for previous destruction has also not been given to villagers. THDC’s claim of illegal encroachment on their land after 2013 disaster is also false as the govt. only given the land to the villagers. The investigation report is not come out in the public even after the visits of officials and now because of the movements and protests against these irregularities, the company who has been given the contract is filing false cases on villagers for disrupting the work. Similarly, the villagers have been framed in the village where the tunnel starts and village above Power House. Whenever people protested, they were framed and cases were filed against them, on the other hand the company kept moving ahead with the project work. This clearly shows the policies of World Bank where they are in a way against their own safeguard policies of rehabilitation and environmental and proving the work of Dam project right by ignoring the serious issues of rehabilitation and environmental devastation. On blatant violation of World Bank policies, the affected villagers had complained with the so called independent investigation team in which the process took more than one year of time but the report has miserably failed to address the real issues. After which the company and the World Bank is working without any hesitation and when the villagers protested against the progress of dam work, they were endlessly framed by THDC and their contracted companies. Today almost 74 villagers are facing the legal cases in the dam affected area. Ms. Sona Thakur, Mr. Piyush and a bank official were presenting the World Bank team. There was no information ever with the villagers and the Gram Sabha about their visit. The team has failed miserably to answer the questions and the real picture narrated by people during the meet. Ganga need to be independent from the destruction then only the Himalaya and its inhabitants will remain protected and healthy. We will continue to take this struggle and movement ahead.